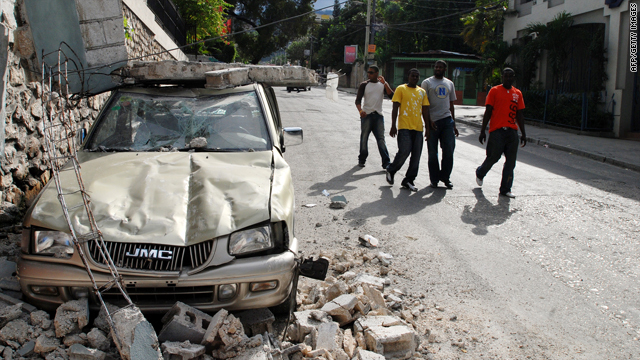 Port-au-Prince, Haiti (CNN) -- President Rene Preval said Wednesday that in the aftermath of the devastating earthquake that hit Haiti, he has heard reports of death tolls ranging from 30,000 to 100,000 -- but he said the true toll is not yet known. "Let's say that it's too early to give a number," he told CNN's Sanjay Gupta at the airport in Port-au-Prince. Preval made his comments after touring the damage. "You have to see it to believe it," he said. "Lots of houses destroyed, hospitals, schools, personal homes -- a lot of people in the street, dead." Nearly 24 hours after the earthquake, injured people remain on the street. "We don't have the capacity to bring them to the hospital," Preval said. A priority is to clean up the streets, which are clogged with abandoned cars and collapsed buildings, so that rescue workers can do their work, he said. Preval said he himself had not been spared. "I cannot live in the palace; I cannot live in my own house," he said. "The two collapsed." He added that he did not know where he was going to sleep Wednesday night, but was not worried. "I have plenty of time to look for a bed," he said late in the afternoon. "But now I am working on how to rescue the people. Sleeping is not the problem." He called on the international community to be generous. "We need doctors, we need medicine, we need medical help in general," he said. Preval said he was confident the capital of the poorest nation in the Western Hemisphere would not erupt in violence. "The people understand the situation, and they see that everybody is doing their best to help them," he said. Asked what he wanted to tell the world, Preval said, "I want to thank all the countries that have started to help us," and then he went through a list that included the United States, France, Canada, Cuba, Venezuela, Argentina, Dominican Republic and Israel.